Oh dear! Allure magazine has gotten it all wrong this month. 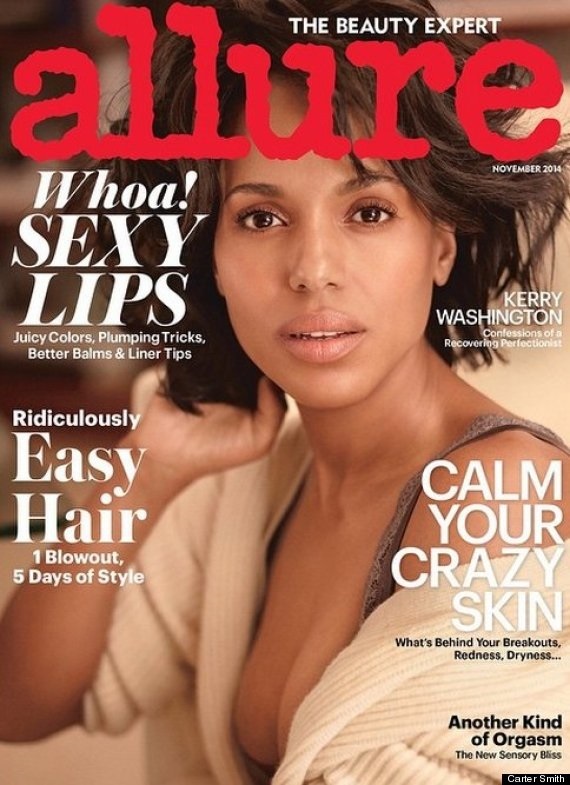 The beauty-focused magazine features Kerry Washington as its November cover star and has photographed her makeup-free. While it’s often a pleasure to see magazines breaking the mold, forum members accuse Allure of contradicting itself. Kerry is shot by Carter Smith for the soft portrait wearing a thick-knit cardigan teamed with a plunging gray bra — looking like she’s just gotten out of bed. The minute the cover surfaced on theFashionSpot forums, members began to let loose. “I’m hating these no-makeup covers. It didn’t do any favors for Regina George and it’s not doing anything for Kerry either,” rants an unimpressed A.D.C. “Lol she looks ill… I really don’t like these no makeup covers,” replies GlamorousBoy, in agreement. “I mean here you have a stunning woman who has great style, is on a hit TV show, and appears thoughtful and intelligent in her interviews. Yet somehow magazines never seem to use her well for the covers! This is even worse than that god awful Lucky cover!” disapproves Miss Dalloway. Are you a fan? See inside the thread for more disapproving reviews and join the discussion here.